I was totaling the cost of our dinners this past week to use as a tool for planning meals in the future. I'm trying to balance ease of making dinner with low cost. Some dinners just cost a lot more, yet are quick to make. And some dinners cost very little, but are labor intensive. But there are a handful of meals that are both cheap and quick 'n easy. Those are the meals I'm trying to ferret out. I'm putting together a basic menu plan for weeks with little time and tight budget, for my own use. I ranked my dinners as "very easy", "easy", "so so", "time intensive", and I would have "extra time intensive", but I rarely put together weeknight dinners in that category. Those dinners would fall on major holidays, like Christmas, Thanksgiving and Easter. And this week, I didn't even make a time intensive dinner (something like meatballs would fall under "time intensive", for me). I had 3 "very easy" dinners this week. The PB sandwich picnic dinner, the egg-fried rice, and the Italian chicken sausage dinner. Of those 3, the PB sandwich picnic and the egg-fried rice were both under $2.00. I could tweak each individual menu and make some of them easier or less expensive. And I'll work on that in coming weeks. I think it's important to have a couple of super easy, but still cheap meals in your back pocket, for those hectic days. So, how did your week go? Any super easy, but cheap meals this past week that you'd like to share with us? Have a great weekend! And if you have a holiday this weekend, enjoy your long weekend! It has been a very busy week but I knew going into it that it would be. Tuesday--leftover potato and carrot mash with hotdogs that were leftover from an open house this summer. You weeks meals all sound tasty. What's a potato and carrot mash? Is this mashed cooked carrots and potatoes? Or is there something else in it? Have a nice long weekend, Alice! Love the picnic meal! Sounds perfect! Friday nights, my husband has a regular meeting, and my son is usually out with his girlfriend, so it's just the girls and I, every Friday. We've been enjoying our picnics together. And I make sure to make them super easy on me, cooking-wise, as I have a lot going on on Fridays. I have a hard time breaking meals down that way because I almost always cook with leftovers in mind for the next day. I think my "cheapest meal" was simply a clean out refrigerator day where I threw a little bit of everything in the frying pan and called it a stir fry...lol. Those clean out the fridge suppers can be some of the best. Our burritos were a bit like that. In addition to the cooked beans and cooked rice in the fridge, I also had about a cup of cooked steel cut oats, which I added. It gave the beans and rice a creamier texture. Have a great weekend, Busy Bee! You are more organized than I will ever be! I like your picture of the pears. We have yet to have any this year. Looking forward to them! All of the tree fruit was early this year. 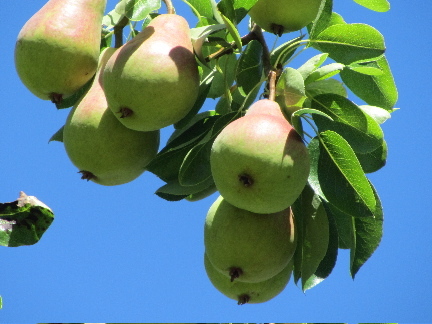 We still have the late pears to come, though. I like calculations. Thats just me. Fortunately, we don't all need to love calculating for this world to continue to function! And in fact, we need people, like you, with other strengths, to make this an enjoyable world! Great prices on all your meals...however, for us, vegetables from the garden would not be exactly free. This month, we spent $50.60 on garden pots (5 large plastic), seeds (about 10 packets), and 5 cu ft. bags of organic garden soil. Plus, our water bill is our most expensive utility bill, so to water our small vegetable garden, I estimate at least an additional $20 a month. But we treasure our garden supply of vegetables so much, it is worth every penny, but I am very much aware it is not free either. We bought a rotisserie chicken again from Sam's. We ate that for several nights. My husband made a large bowl of macaroni salad earlier in the week, and we ate lots of garden vegetables every night, swiss chard, beets, and green onion knots with miso sauce. I have my daily kangkong (need to eat this for fiber). We had freezer readymade pizza for one meal, and can't remember what else. I think our appetites (husband as well) are about half what it used to be just a year ago. Do you have any way to collect rain water for your garden? I've heard that homes in desert regions don't have rain gutters. Do homes in Hawaii have them? Hopefully, your outlay for gardening supplies won't need to be repeated often. I'm not sure if you have enough room to allow some of your plants to go to seed, in order to collect the seeds. But if you do, there's a way to eliminate the cost of seeds, at least. Last year, I let the parsley go to seed, and I now have enough parsley seeds for several years. This year, I've let a carrot go to seed, and am hoping to collect seeds before cold rain returns, for a 3 or 4-year supply of carrot seeds. I choose a different veggie each year, and hope to collect enough seeds for several years of that one item. The seeds that I need buying are for hybrids, mostly. Even there, though, a high-producing vegetable, like tomatoes or zucchini quickly pays for the seeds in the first couple of pickings. So, maybe my garden veggies aren't completely free, but the cost per meal for veggies is quite low, no more than a few pennies, I imagine. With our fruit trees, I figure those as free fruit, as I would have planted an ornamental tree in their place, had it not been for wanting the fruit. And now that we've had some of those trees for about 15 years, they've paid for themselves, and then some. I find I'm not nearly as hungry as I was just a few years ago. I used to work childcare 1 to 2 days per week, and I would eat like a horse on those days. Activity levels really make a difference in caloric requirements. So given your former business, it's not surprising that yours and your husband's appetites aren't what they were a year ago, before retirement. Hope you have a great weekend, YHF, and that the grandkids were able to come for a visit afterall! We have gutters and good drainage because when it does rain, it pours. But that is so rare...it has hardly rained this year, our first year working a backyard garden. We put in some drainage pipes....that is not working as well as I had hoped. I think even that amount of extra water is insufficient against the hot sun. My husband has to water twice a day or the vegetables look stressed and wilted. You're lucky to have so much rain!! I have the same problem with water here in arid Colorado. But I made a drip irrigation system from an old garden hose - just put a cap on the end and strung it out around the plants, punching a hole near the base of each plant for the water to trickle out. It's by far the easiest and most efficient system I've come up with so far. I had to get a bit creative for the plants that are in pots and not in the ground itself - used some bits of bailing wire to hold the hose in place atop the pots, but it's sooo much easier than sprinklers or watering by hand, and you use much less water. Oh, and mulching heavily with grass clippings helps too - both in terms of keeping the soil from drying out and providing some food for the plants (grass clippings are very high in nitrogen.) Good Luck! A drip irrigation system sounds like a good idea but I'm having trouble visualizing this. What happens when you plant the next crop and the position of the plant changes. I think the mulching idea is a good one...thanks!! Well, there are different strategies. If you plant in rows, then it's pretty easy - you just punch a hole every few inches and it works sorta like a soaker hose. That's what I've used for the flowers and ornamentals around the border of my front yard. I plant my veggies much more haphazardly, so I just chose a hose that was longer than actually needed to reach around the garden (you could easily screw two together if need be - it's not like leaky old garden hoses are hard to come by - just send out the word to all your neighbors and you'll have more than you can possibly use, I promise!) They you just wind it loosely between the plants, leaving a few feet of slack between each one and the next, so that it's easy to line up the holes and the plants even with spacing variation year to year. Thanks for the link to your blog...I wish we kept our old hoses. I'm sure my husband threw away three old vinyl hoses when we replaced with rubber hoses. Looks like you had some very good results, so I'm encouraged. I'm thinking of making holes evenly apart and just move the hoses where I want to plant the next seedlings. I hope that works...so bummed...now we'll have to wait till the rubber hoses break. They seem pretty good quality (Craftsman). Try Freecycle - I'd bet there are people around you who would love to give you some old hoses. Well, my super easy cheap meal for the moment has been smothered bean burritos. You just wrap some refried beans in a tortilla, smother with green chili & a sprinkling of grated cheese. Top with shredded lettuce (or any mild green), garden tomatoes, scallions, and sour cream or plain yogurt. I've been too lazy to make all of the elements from scratch (tortillas, refried beans, green chili salsa, sour cream/yogurt) but it's still super cheap & easy - at least it's easy here in this neighborhood where refried beans, tortillas & green chili can be purchased pre-made for about 15 cents a serving. Your pears look so good. I'll have to get tips from you in our new place where there are two pear trees. All I know for sure, is that they need pruned.